Walkways have always been used to provide a solid surface for mobility above soft soil conditions such as beaches, playgrounds, trails, and other soft or wet soil conditions. Many walkways, including ADAWALK, are designed specifically with the disabled in mind, to provide a solid surface for access by one using a wheelchair, cane, walker, etc. Many of these walkways were traditionally made from wood and many, especially those used on sand beaches, were designed in sections so that they could be moved around or installed seasonally. Although these wood walkways are functional, they have some drawbacks such as splinters, nails popping, warping boards, heavy weight and the need for routine maintenance. 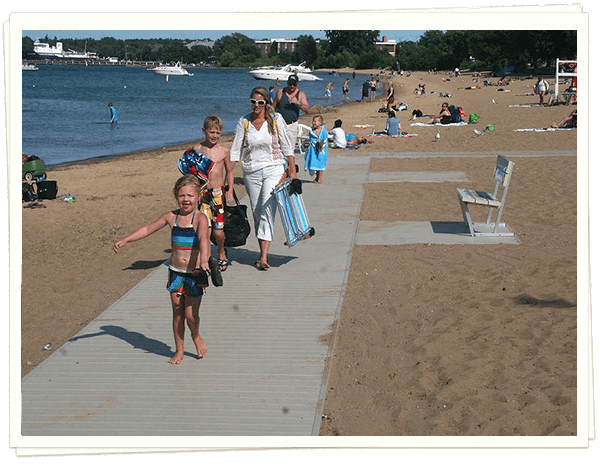 A more recent type of walkway design is the roll out mat or molded beach matting panels. These are quite often made from recycled plastic materials. These systems are generally easy to install, although most are required to be staked down in order to prevent the wind from blowing them over or away. These beach matting systems are not structural, so they tend to follow the contours of the ground, which can make it difficult for one with disabilities to use. If not properly installed and maintained, most show a short life span and most offer a short term warranty or none at all. ADAWALK walkways are designed to overcome the issues of wood and roll out type walkways. ADAWALK’s patented system was designed specifically with the disabled in mind, but is equally useful for all, young and old alike. Sample of walkway panel with 1¼” thick solid surface vinyl decking. Typical panel length is 8’and widths from 3’ to 6’. 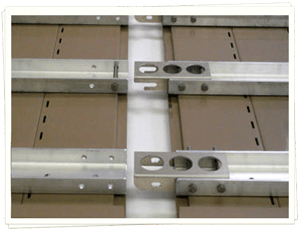 Aluminum substructure consists of structural aluminum C-Channels that are designed to submerse themselves into soft ground, but work just as well on hard ground applications. 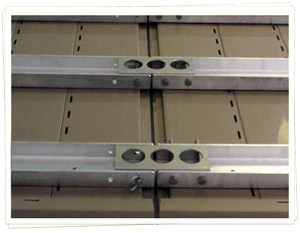 Factory installed splicer channels on the end of each section lock the walkway sections together. Our patented connection system is the heart of the ADAWALK walkways. The design criteria for the connection system is to provide positive, fast and easy to use connections that will hold up against long term, heavy traffic. Two types of splicer channels join the sections together. The center splicer channels are designed with a slotted groove to keep the center stringers together without the need of adding any fasteners. The two outside splicer channels attach to the joining sections using marine grade detent pins for a quick and positive attachment. Detent pins are tethered to each section to prevent loss during installation and removal. Quick connection brackets are included for joining sections together side by side to create platforms or resting sections along with other brackets that allow additional sections to be installed perpendicular to the main walkway to access other areas, such as a playground or another access point. 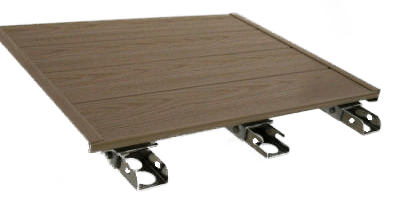 Walkway accessories like benches, storage boxes and flagpoles come with quick release mounting brackets that, once initially installed, allow the accessory to be installed from on top of the walkway. Solid vinyl decking has a comfortable, slip resistant surface that has no exposed fasteners providing a safe, barefoot friendly surface that holds up well from high traffic use. Both solid surface vinyl decking products come with a 10 year warranty. 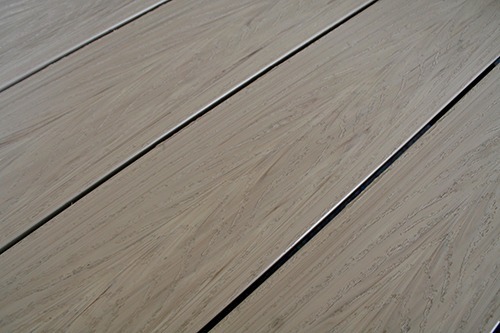 Solid vinyl decking is an ultra low maintenance alternative to wood and other engineered decking products. 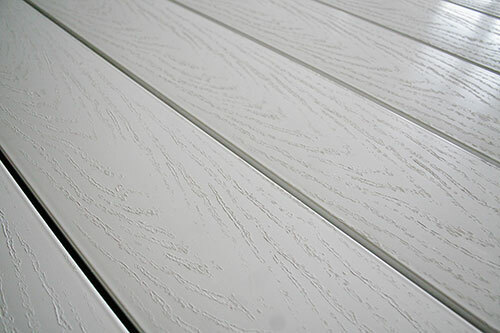 Gorilla Brand PVC decking requires no airflow clearance, so it can be placed directly on the ground. Lighter than wood and never needs staining or painting. Click here to access design files including cad drawings, specifications, videos and related documents. The CAD details program is specifically for design professionals with the goal of getting manufacturer-specific product information into your working plans. Michigan Lake Products provides innovative, economical, and safe solutions to the accessibility needs of their customers. They provide quality products so everyone, including people with disabilities, are able to enjoy our beaches and natural resources. They’ve researched, tested, and re-designed their products based on honest feedback from people with disabilities in our community. We are thankful to have a local company that is invested and dedicated to creating universally accessible spaces in our region.